We have harpists for all types of occasion. Whether it is for weddings, funerals, work functions, corporate events, anniversaries, cocktail parties, lunches, dinners or birthday parties we can help. 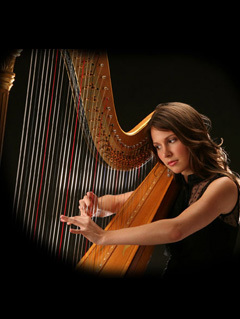 If you need some soft background music at a reception of any kind we have the perfect harpist for you. Our harpists can play classical, soft rock, folk, stage, traditional Celtic or more modern music. The harpist’s music can be played inside or outside. Harp music fills your soul, relaxes you and lets you sit back and enjoy the harp music. The harpist can be accompanied by a singer or other musical instruments but are wonderful all on their own.